Muscadet is one of those wines that puts me in mind of the 1970’s. It has had a bit of a dodgy reputation as a wine dashed out of the cellar doors to make some quick cash for wine makers. Now Muscadet seems to be making a comeback with a new crop of winemakers putting more effort into making fresh wines. Rather than being part of supermarket 3 for £10 offers, it’s more likely to be in the one for £10 offer. 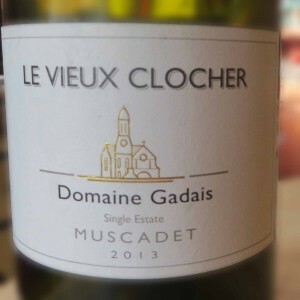 This Le Vieux Clocher Domaine Gadais from Laithwaites was a midweek choice. It looks pale and interesting, and it smells of lemons as well as grapes. Yes I know wine is made of grapes but it rarely smells of wine, but in this case it does. It tastes a little of grapes too, but with more lemon and some fresh mown grass too, making it positively spring like. It’s dry with an alcohol level that’s on the low side of medium, making it enticing to have a second glass. It’s fresh and works well cold. I had it with a plate of linguine vongole, or at least my home made version of it, and added a splash of it to the sauce. It may not have been an entirely French experience but it was good.